I have been thinking about the poem “Stone Circles” a lot lately. Perhaps it is because the forest is sleeping and the boulders are standing out in all their glory, or maybe it is the warmth that they hold in the sunshine when everything else is cold. When I first came to the Sourlands I had thought that the boulders were here due to glaciation, but in fact I was mistaken. The terminal moraine (a moraine is a collection of rock debris [boulders] that were pushed along by a glacier) does not cross the Sourland region (read more about where it did cross New Jersey here!). Instead these diabase boulders were part of the bedrock (formed by slowly cooling magma beneath the Earth’s surface) on the ridge of Sourland Mountain. Over millions of years as the tectonic plates continued to slide east and west the ground, no longer flat, was forced to fold up into what is now our Sourland Ridge. All of this pressure caused large cracks, called faults, and smaller cracks, called fractures, which to this day form the primary source of groundwater storage for our wells in the Sourlands. Erosion of the softer layers of sedimentary rock covering the diabase, plus the melting of the the permafrost covering the earth’s surface during the ice age exposed the diabase bedrock. During this thawing some of the bedrock broke and slid down the side of the mountain in large pieces and experience spheroidal weathering, which gave these boulders their rounded appearance. David Harper, a local geologist, leads hikes for the Sourland Conservancy through the Somerset Sourland Mountain Preserve and discusses in great detail the rich geology of this region (buy his book here!). Keep an eye out on our events page for our 2019 Hike flyer to find out when he will be leading his next hike! This entry was posted in Uncategorized on January 31, 2019 by Carolyn. Thompson Preserve – Sub-zero hiking! Thompson Preserve is located on Pennington-Hopewell Rd. Link to trail map and description. This was the coldest hike I had ever been on. The air temperature was a whopping 8 degrees above zero, but with windchill, the temperature felt like negative 10 degrees fahrenheit!!! I usually enjoy hiking with friends, but I particularly love company on a day like this when I would have only had myself to complain to about how frigid it was. When you have companionship in such challenging circumstances, the comrade in your adventure helps you to ignore your cold woes and fully immerse yourself in the adventure at hand. One of the reasons that I enjoy going on hikes with others (beyond just hanging out with favorite friends), is that each person sees the world from their own unique perspective and contributes different expertise and interests. I am the one who always wanders around searching for plants, while others may be interested in identifying insects, birds, reptiles and geology. My former roommate is a veterinarian and without fail, each time we are out, she spots the animals that I have overlooked. She is very in tune with the animal kingdom and I always learn from her. Today, she provided me with an anatomy lesson on the white-tailed deer, Odocoeilus virginianus. My friend and I bundled up really well and waddled on down the trail. The last time I was at this preserve, I saw a deer carcass in a tree. The carcass we found today in a tree was much smaller than the one I had seen back in September. I don’t really know why the deer remains were up in the tree, but perhaps someone placed them there so that people walking their dogs wouldn’t have to wrestle yummy deer bones from their dog’s clenched teeth. Actually, later on we did notice a dog trotting along triumphantly with a deer elbow in his mouth. My friend points to the costo-vertebral junction, which is the place where the ribs meet the spinal cord. This pocket is called the acetabulum, where the head of the femur meets with the pelvis forming the hip joint. We found the head of femur about 200 yards away. It appears that the rest of the femur has been chewed up. Even though the Thompson Preserve is now just a sea of browns and grays, I can see the colors of summer in my mind’s eye. Frozen jelly fungus, Exidia recisa. I love how the frozen water mimics veins and arteries inside this mushroom! American sycamore, Platanus occidentalis, fruit. This type of fruit is called a “Plumed Achene”. A plumed fruit is one that has tufts of hair attached to the achene. An achene is the dry outer casing that holds the actual plant seed and is indehiscent (does not open to reveal the seed when it is mature). Right before the cold snap, there was a large rainstorm which flooded portions of this preserve. This ice is so clear that it seemed as if we were walking on glass! Air bubbles trapped in clear ice! At first, I thought that these may have been sulfur gas bubbles because the soil nearby had a classic rotten egg smell. But it’s more likely that air bubbles were traveling under the surface of the puddle and then as the water froze, so did the oxygen bubbles. My friend snapped a photo of me trying to capture a picture of the frozen air bubbles! I know I keep saying this, but this truly was one of the most amazing natural phenomenon that I have ever witnessed! My friend’s finger is underneath this frozen ice shelf/cloud. First there was a frozen puddle with an air pocket, and above it, a floating sheet of ice. I have no theory as to how this formed but would absolutely love to know from you if have any ideas! Take another look at this floating ice shelf! On the bottom is the frozen puddle, then there is about 3 inches of air, topped with this floating ice shelf. Could this be any more amazing??? Whenever I see frozen streams in the winter, I always wonder where the fish are living. As we walked along this stream, I noticed that it was mostly frozen except for one area where the water was deeper and moved quickly. Suddenly, out of the corner of my eye, I saw a flicker of a fin… a fish! Although the surface of the stream was frozen, underneath a couple of fish were swimming around! Here is my very unglamorous and shaky video of the fish swimming under the ice! This entry was posted in Uncategorized on January 24, 2019 by Carolyn. Eames Preserve – a really cold morning! Eames preserve is located on Harbourton Woodsville Rd in Pennington. Link to trail map and preserve information. The weather has been quite chilly. But after weeks of confinement inside the house with sick kids and obligations, I began to feel claustrophobic. I rarely poke around my home or office in an attempt to find something new. Usually, I am just trying to “unsee” the mess. But even when it is 20 degrees Fahrenheit outside, I am happy to spend time in the woods peering around rocks and turning over logs. There are always some fun new things to discover just beyond the bend of a trail. It has been six months since I last visited the Sourland’s Eames Preserve. I used to work on a research project at Eames and I have been there more times than I care to remember, yet I had not explored my way through the entire preserve. When I was working, I would hike to the designated research area and then hike directly out again. Today, the woods at Eames were calling for a deeper exploration. A small mushroom with frost emerging from both sides. This may be the hoof print of a deer superimposed upon the paw print of a dog. It seems to be the most logical explanation. It appears that this coyote devoured another furry creature. Although I am really not a fan of the cold weather, I must admit that these frozen puddles are beautiful! Witch Hazel, Hamamelis virginiana, is still holding onto its final blooms from 2018. It reminds me of how we like to believe that we start the New Year fresh with a clean slate, but in reality, we all still carry remnants of the past. This bench is situated at the halfway point of the loop. I can imagine hiking here with my family in the summer time and having a picnic. The boys will love to play in the stream! A burl! These abnormal growths on trees can be caused by many different things such as an injury or a disease. As the tree grows, generally so does the burl. The burls are not detrimental to the trees, but since burls are prized by woodworkers, they sometimes poach the burls from live trees. Depending upon the size and location, removal of the burl can be catastrophic to the living tree. Read more about woodworking with tree burls here! I recommend a google image search of “Woodworking Tree Burls”. These leaves were frozen in a little vernal pool. Spring Beauty, Claytonia virginica, leaves peeking out through the leaf litter. These little ones most likely sprouted during the warm spell we had two weeks ago but unfortunately with this really cold weather, they will not make it to bloom. I wasn’t able to take a picture that truly captured what I was seeing here. These Wineberry canes, Rubus phoenicolasius, were glowing in the understory. I am looking forward to all their berries this spring! A bleeding canker. There are a couple of things that can cause bleeding cankers, but usually it is either a species of Phytophthora (root rot fungus) or bacterial wet wood. This entry was posted in Uncategorized on January 17, 2019 by Carolyn. Hopewell Borough Park – A rainy Friday morning with my oldest. My oldest and I spent the winter solstice together running errands and visiting my office. It was misty, drizzly and almost 60 degrees and we were itching to get outside! I love warm, rainy days when we can splash around in puddles without fear of freezing! My husband and I have been reading the “Winnie the Pooh” books to the wild boys quite often lately and they have seen “Pooh’s Grand Adventure”. Now, my oldest little dude is determined to have a “Grand Adventure” for himself. At first, my little dude wanted to go to the playground but when he saw the lake-puddle, he changed his mind and decided that he needed to play there instead. He did not hesitate at the edge of the lake-puddle, but walked straight in. We change the world just by being in it. This morning, my sweet little dude noticed that I was wearing my Sourland Conservancy shirt and he immediately insisted that he wear his Sourland shirt, also! Little Dude asked if he could take some pictures. Here is his picture of the waterfall. I love how something that an adult perceives as a barrier is only a challenge for a child. Hidden mushrooms. Most likely, the mushrooms growing between the logs have received some protection from the cold. We still had to check out the playground, of course! He really wanted to be able to float in his umbrella just like Pooh. There was a part of me that wished that I had brought my wellies so that I could explore the lake-puddle with him… But I also really loved that I could just watch and let him explore on his own. This entry was posted in Uncategorized on December 23, 2018 by Carolyn. Skyview Preserve – a quiet morning with an itty bitty surprise! Skyview Preserve is located on Marshalls Corner Woodsville Rd, in Hopewell. Link to hiking map and description. Today was just one of those days when no matter how quickly I tried to accomplish the tasks at hand, I was always running about five minutes behind schedule. When I go into the woods, I don’t worry about such things. I usually don’t hike very far, choosing instead to spend my “alone time” in nature looking through leaf litter or searching for flowers. Even though I have studied the plant ecology of this area for over a decade, each time I am in the woods I learn something new. Today was no exception. When I had this new experience, I was almost as excited as my children were when they visited Santa Claus this past weekend. I will tell you more about it, later. I also would like to take a moment to thank my mother, Nancy, for her help editing this blog. She helps me organize my runaway thoughts and puts it back on the right path. Thank you, Mom. It is deer hunting season so it is important to always check and make sure that the preserve you wish to visit is open to the public! Even if the preserve is open for visitors, for your own safety, it is important to wear high visibility colors during deer hunting season. I always keep my Sourland Conservancy High Visibility baseball cap and beanie, along with an orange vest, in my car so that if I decide to go for a hike, I am prepared! I really love this foliose Lichen, which was growing all over the Skyview Preserve. It reminds me of the kale I left in the back of the refrigerator. “If it’s hairy, it’s scary!” Once those “leaves of three” fall off, it is a little more difficult to identify Poison Ivy, Toxicodendron radicans. If you come across a vine with many aerial roots causing it to appear quite hairy, you can be pretty sure that it is Poison Ivy and not Virginia Creeper, Parthenocissus quinquefolia. Virginia Creeper tendrils tend to be thicker than Poison Ivy’s and don’t look quite as “hairy”. To be on the safe side, it may be prudent to avoid touching a vine you can’t identify! It looks like someone was pecking away in a forage for insects. I don’t know a lot about birds, but I have sometimes wondered if each particular species of wood pecker leaves its own distinctive peck marks? A good question for the National Audubon Society or your nearest ornithology lover. This tree was covered in mushrooms, a tell-tale sign that it is not much longer (or is no longer) for this world. A forest of sphagnum moss. Sporophytes as far as the eye can see! A vernal pool! A vernal pool is a body of water which dries out each year (or almost every year) and does not have a resident fish population. It is commonly thought that vernal pools appear in the spring, but the profuse rain this fall has caused the pools to fill. I can imagine all the salamander and frog eggs which will be contained within this pool come spring. Last year, I really wanted to experience the Sourland Conservancy and Mercer County Parks Commission’s “Remember the Rain” event. I completed the training to be an Amphibian Crossing Guard. Unfortunately, my time “on watch” and the rains were not in sync, so I was unable to chaperone the salamanders and frogs on their migration. I am anticipating the crossing this coming spring and hopefully the rain drops and my “crossing guard” schedule will be in alignment in 2019! Read more about the “Remember the Rain” project here. It was an absolutely beautiful morning and not quite as cold as the previous few days. I did not hear many birds or see any mammals besides a few white-tailed deer. I had a pleasant walk in both the woods and in an open field, and I was not too muddy either, considering all of the rain that has been falling lately. Ok, so I saved the best for last. While I was walking along the path I happened to look down at a Shagbark Hickory Nut, Carya ovata, and observed what seemed to be teeny, tiny, jumping grains of sand. Can you see them? There are 8 of them in this picture! I believe these are Springtails/Collembola, belonging to the order of Symphypleona, but I’m not completely sure. Collembola are very small, sometimes microscopic, insect-like organisms which live in and on the soil. They have an appendage on the underside of their body which can “spring” them away from danger – also known as my boot! These little critters are fascinating! Here is a really great link with tons of great photos and information on collembola. Also, if you have a desire to relax, please watch this video of collembola hanging out by the water’s edge. This entry was posted in Uncategorized on December 21, 2018 by Carolyn. Hopewell Borough Park – A cold morning walk. It has been a long time since my last Walk in the Woods and I have been craving a reconnection with the natural world for weeks now. There have been deadlines, meetings and many errands as well as preparing 70+ children for their annual holiday concert at the daycare where I work part time as a music teacher. My own children have been sick- ‘Tis the Season to be Sneezin’- and the myriad of responsibilities that go along with being a human being at the prelude to Winter has had me feeling overwhelmed and depleted. Just like cooking, some of the responsibilities and joys in my life had to simmer and so my walks in the woods were moved to the back burner as I tried to stir all the pots that were heating on my stove. My time in the woods replenishes my spirit. The quiet, the smell, the colors and textures, the presence and absence of life in the outdoors is what coaxes me back to my true nature. Her Words of Wisdom remain true. How often do we compromise our own mental and physical health in order to keep all the pots cooking and the house from burning down? Today’s walk was the comforting and delicious chicken soup which my mind and body so desperately needed. I spent most of my time looking for frost covered leaves so that I could blow on them and watch the ice melt, a nice antidote to all the heat that I had been feeling. It was relaxing and peaceful and exactly what I needed in order to dampen down all the fires which were burning in my life. For this holiday season I am asking all of you to put on your oxygen mask first and do something which rejuvenates and restores you. Make it a priority to do something for the pleasure of it, not because it is something you have to do. Creeping Charlie (ground ivy), Glechoma hederacea, an invasive that is the bane of my flower garden’s existence. No matter how often I pull it out, this recalcitrant vine keeps on creeping back into my flower beds. One of my favorite things about a Walk in winter is observing the frost covered earth. This morning, the ground sparkled as if a little fairy had sprinkled glitter all over. My oldest has been talking a lot about pixie dust and flying and I wish that he had been with me this morning so that I could show him the shimmering ground. I could imagine him rolling in the sparkles and then running fast while leaping into the air in an attempt to fly. I remember that I was determined to take flight when I was a child. My brother and I made a hang glider-like contraption with some dowels and a sheet and I ran as fast as I could and jumped off our porch….. and crashed to the ground. I climbed the trees in our yard reaching more than 20 feet up by the time I was four years old (the same age as my oldest) and I can’t imagine the anxiety I caused my parents. My oldest is also a fearless climber and I am sure that the day will come when he tries to build his own wings in order to soar. But for now, pixie dust and his own imagination will take him skywards. Japanese honeysuckle, Lonicera japonica, berries. As the migrating birds pass through there are fewer and fewer berries left behind. These berries were quite shriveled but I am sure they also will be eaten soon. I haven’t seen many mushrooms as of late, but these ones looks so neat covered in frost! Japanese honeysuckle, Lonicera japonica, and Garlic mustard, Alliaria petiolata. 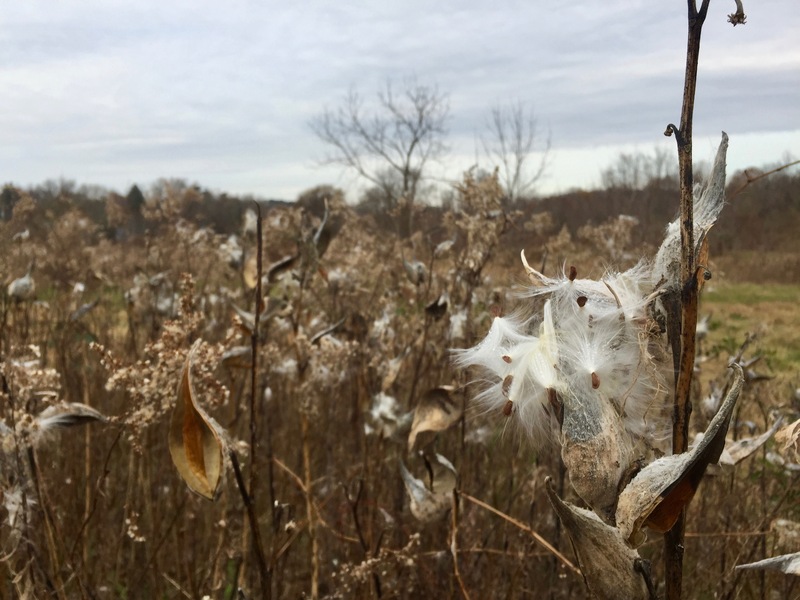 These two invasive plant species are some of the last to go dormant in the winter and some of the first to awaken in the spring. I love how this frozen puddle looks like a topographic map! I am curious about what may have caused it to freeze in this manner. I inspected the puddle carefully and it didn’t appear to be shattered in the center. My husband is a GIS (geographic information systems) developer and I know that he would get a kick out of this ice ‘map’. Virginia Strawberry, Fragaria virginiana, a native edible hiding beneath the dormant Goldenrod is receiving its last bit of photosynthesis before descending into winter’s sleep. I love this little bit of foreshadowing of what is to emerge in the spring. It is something very yummy to look forward to! This entry was posted in Uncategorized on December 13, 2018 by Carolyn.